Thank you brides! Your reviews of our wedding beauty services and team members have led to us winning the prestigious “Best of Weddings” award with the Knot. 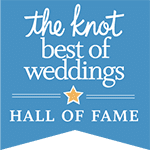 And after winning that award four years in a row, we’ve been inducted into The Knot Best of Weddings Hall of Fame! Our talented hair stylists, makeup artists and pro office team are proud to be one of the best wedding vendors in the country serving the loveliest brides in the world. No thanks would be complete without giving thanks to all the wonderful venues, coordinators, photographers and other vendors that have come to trust our consistency and quality and continue to refer us year after year. We love you Central Florida! © 2018 M3 Makeup | Bride photos copyright their respective owners.